Alright, fine, it’s a campaign for the South West Regional Development Agency, created by Rubber Republic. It arrived in my inbox last week, with a subject line containing “Viral Campaign”*, so it was within an inch of getting deleted without a second look. Being the end of the day, I was looking for distraction, so I had a look at the video, to find myself delighted by how silly it turned out to be. I love organisations with a sense of humour, and this one’s just wonderfully twisted. Kat from Safety Goat is a London-based designer, she sent us a really awesome little silicon moulded goat, equipped with safety vest. 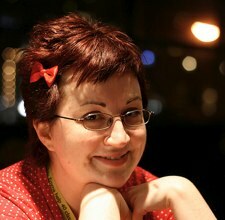 I’ve yet to meet Kat (@kassy4), but she’s a fellow Ottawa-ian (as she says), which is rare in the UK. Plus, anyone who creates wacky little creatures and hand-paints them has just got to be very cool! Natalie Dee draws really cute stuff. I'm a camel, I'm a balloon, I'm an entirely Flash website! Poke, a digital agency in London, created this funky campaign for Orange mobile’s Pay As You Go tariffs – you know, the raccoon, camel, canary and dolphin balloons? Yeah, well, if you see a camel called Vero fly by, don’t adjust your medication – it’s just me floating by. The campaign involves floating from one website to the next, in a StumbleUpon random-new-site manner, using your air canister to boost yourself along. You pick up stars, more air canisters and rainbows along the way. All this nonsense for the sake of an Ibiza holiday for the winner. It’s cute, it’s entertaining, but my one gripe is that the entire site was developed as a gigantor Flash animation. I’ve been known to whinge about Flash before, and I’m just not a fan of sites that have no deep-linking or easy ways to navigate. Plus, it makes my Mac whirr itself into a frenzy! But I just can’t help it, I keep on travelling! So go on, Boost my Camel, baby! om nom nom nom, originally uploaded by thatcanadiangirl. Recently, a friend of ours, Simon, moved to Over, just North of Cambridge, UK. He was moving to a lovely property, with a nice garden and a pond. Simon wasn’t so keen on the pond though. It’s not very child friendly, and with two young ones running around the garden, he thought it would be safer to get rid of it. A few buckets and hours of sweating later, Simon lifted the pond lining to discover a laminated piece of paper sitting at the bottom of the gaping hole that once was the previous owner’s pond. 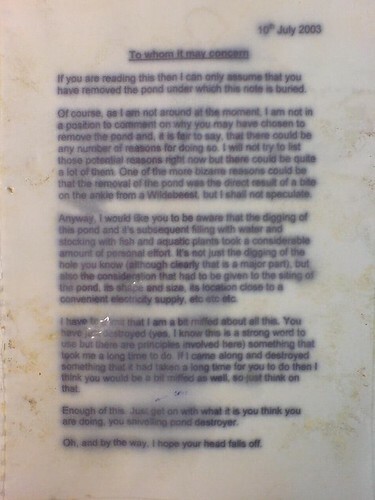 If you are reading this then I can only assume that you have removed the pond under which this note was buried. Of course, as I am not around at the moment, I am not in a position to comment on why you may have chosen to remove the pond and, it is fair to say, that there could be any number of reasons for doing so. I will not try to list those potential reasons right now but there could be quite a lot of them. One of the more bizarre reasons could be that the removal of the pond was the direct result of a bite on the ankle from a Wildebeest, but I shall not speculate. Anyways, I would like you to be aware that the digging of this pond and it’s subsequent filling with water and stocking with fish and aquatic plants took a considerable amount of personal effort. It’s not just the digging of the hole you know (although clearly that is a major part), but also the consideration that had to be given to the sitting of the pond, its shape and size, its location close to a convenient electrical supply, etc etc etc. I have to admit that I am a bit miffed about all this. You have just destroyed (yes, I know its a strong word to use but there are principles involved here) something that took me a long time to do. If I came along and destroyed something that it had taken a long time for you to do then I think you would be a bit miffed as well, so just think on that. Enough of this. Just get on with what it is you think you are doing, you snivelling pond destroyer. Oh, and by the way, I hope your head falls off. 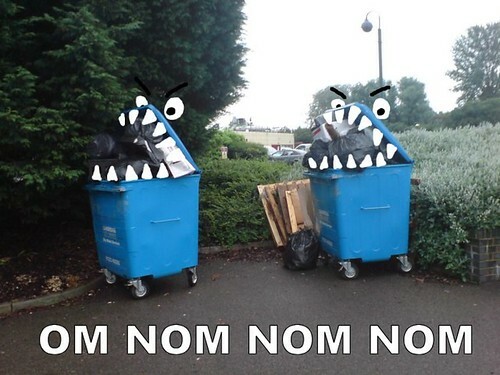 Om nom nom nom: Whoddathunk rubbish bins could be this funny? Star Wars story told by a 3 year old: The shorter the summary, the better. Thanks kiddo, this is way better than the movie!